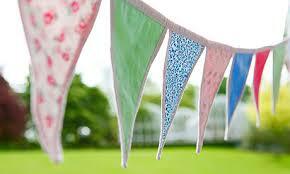 It is with sadness that we recently had to remove our community bunting. The chord in which it was tied has stretched and in some cases snapped, and so for safety reasons we have removed it. We had hoped to keep it up until after the Alva games, but this was not to be. However we will keep the bunting and next year plan to install it using something stronger such as nylon chord that won’t stretch and snap, so all is not lost. We would like to take this opportunity to thank everyone who contributed to the bunting and can assure you that we will be using it again. Next Next post: Survey Prize Draw – We Have a Winner!